Just about everyone I know has an elk hunt on their bucket list, including me. I recently did some research about the available options for elk hunts and I thought I would share with you what I learned. 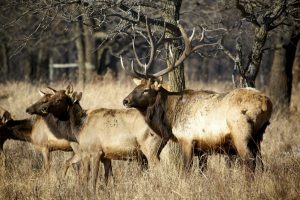 I called up Cabela’s Outdoor Adventures for a free consultation to explore the options, and I got some great advice on what I will loosely group into four different categories of elk hunts. Let’s look at each of them, which will help you choose which one is best for you. On the upper end of the spectrum is a hunt where you will be wined and dined and have a fantastic overall experience. Most of these hunts offer high success rates but you will have a great time even if you do not get an elk. The hunts take place while based in plush lodging, often a five star lodge, and you are taken to your hunting area each day by an experienced guide. They are typically on private ranches where the elk are well managed and your chances of shooting a trophy are good. For the most part these are not the most physically challenging hunts, although you may have to walk a few miles each day. Other times you may be spending more of your hunting time in a 4X4 pickup or ATV, or maybe on horseback. Once your elk is down, it is skinned and processed for you. These lodge hunts are great experiences and the price tag will run somewhere between $8,000 and $15,000. On the other end of the spectrum is a totally do-it-yourself elk hunt. You are responsible for everything from acquiring the tag, doing the research on where and when to go, transportation, lodging, and getting your elk out once you shoot it, which can be one of the biggest challenges of all. Some DIY hunters set up camp or base out of an RV and hike long miles to get into the elk each day. Trophy quality is generally low on these hunts unless you apply for years and draw a special high-quality area. Cabelas T.A.G.S. can help you with that. Some people enjoy the challenge of figuring it out and hunting without any guide or other assistance. This is not for everyone, and the success rates are pretty low, which makes it all the more rewarding when you are successful in going it alone. These hunts are a step above the DIY hunt but you will end up doing the majority of the work yourself. The most common form of the semi-guided hunt is the drop camp hunt. In this case, you consult with an experienced outfitter who helps you choose a location to hunt and provides you with the majority of the equipment you will need. The outfitter will take you and the equipment into the hunting area, normally by pack horse, help set up everything, then leave. You are on your own for hunting. He comes back in to pick you and your game up at an agreed-upon date. This is a good way to avoid the high costs of owning all the equipment and horses, while still taking advantage of the conveniences they provide. A hunt like this will cost between $2,500 and $4,500. 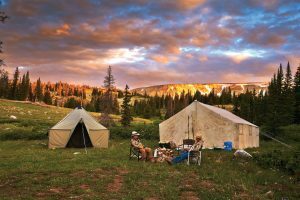 This is much like the drop camp hunt except you will have a guide along to show you the ropes and help you get your elk. You will also most likely have a cook/wrangler who will serve hot meals and help with the everyday chores around camp, including the challenge of getting your elk quartered and back to camp. This hunt, like the drop camp hunt, requires a reasonably good physical condition because some days can consist of rigorous hikes. These hunts have fairly highs success rates because you have someone with experience in the area helping you make decisions. You can also hunt harder because you can concentrate on the hunt rather than worrying about the everyday camp chores such as cooking, chopping firewood, tending to the horses, etc. These hunts will run from $5,000-$8,000. The base camp hunt normally consists of RV’s or wall tents and is typically in an area you can drive to. You will hunt on horses or ATV’s or at times 4X4 pickups. There is a degree of comfort to be found in these camps that cannot be found in the wilderness hunts. You will probably have a tent or trailer set up with a shower, and of course you can make a drive to a nearby town in case of an emergency. Some of these camps are quite plush and offer a wide choice of drinks and plenty of fine eating. When set up in the right area, elk hunting can be excellent. The availability of motorized vehicles eases the difficulty of getting your elk back to camp. The physical activity level varies greatly with the camp and outfitter so make sure you ask questions about that topic before choosing which one to book. Generally, these hunts will cost between $4,500 and $8,000. You know you want to do it. So choose the elk hunt that fits your needs, budget, physical ability and preferences and just go do it. If the spark for a new experience lies within you, the counselors at Cabela’s Outdoor Adventures can help. Give them a call and start planning your adventure today.